Why are the Gaihozu at UW? Resources for researching and using Gaihozu (Japanese imperial maps). The East Asia Library welcomes researchers from a variety of disciplines and international backgrounds to work with the unique items in our Gaihozu Collection, which includes Japanese military maps published from the Meiji era until the end of World War II. 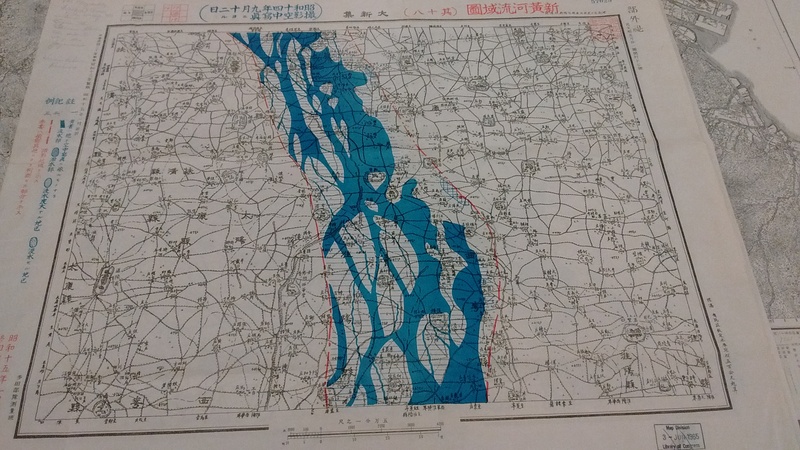 Research incorporating maps from the UW Gaihozu Collection has included a publication on the 1938 Yellow River Flood's representation in maps. What are the Gaihozu Maps? From the 1880s until the end of World War II (1945), Japan's pan-Asian imperial ambitions were reflected through the development of the Japanese empire. Beginning with Taiwan (1895), Japan's imperial territories (Gaiho = 外邦) eventually included Sakhalin, Korea, the Kwantung Leased Territory in China's current-day Liaodong Province, Manchuria, South Pacific Islands, along with countries occupied during World World II. For planning successful battles in foreign lands and to effectively govern colonized areas, it became essential for Japan to create such maps as Gaihozu. Most of the Gaihozu (外邦図) are general topographic maps, covering the areas of the former Japanese imperial territories (Gaiho = 外邦). These maps were created between the beginning of the Meiji Era (1880s) to the end of World War II (1945). These maps were either surveyed and drawn by Japanese surveying squads or reproduced from topographic maps drawn by the land surveys of other countries by an order of Land Survey Department of the General Staff Office, the former Japanese Army. Tada Corps. (Showa 15 (1940)). Shin Koga Ryuiki-zu : Daishinshu [map]. 1:50000. East Asia Library Collection. 多田部隊参謀部. (昭和15年) 新黄河流域図:大新集[map]. 1:50000. East Asia Library Collection. Ryuta Itagaki, Satoshi Mizutani, and Hideaki Tobe, “Japanese Empire,” in The Ashgate Research Companion to Modern Imperial Histories, ed. Philippa Levine and John Marriott (Farnham, Surrey: Taylor & Francis, 2012), 251. ProQuest Ebook Central. Azusa Tanaka and Shigeru Kobayashi, "Gaihozu, Maps of the Areas Outside the Japanese Territory Prepared by the Former Japanese Army, in the Libraries in the United States: Discovery and Processing." (Manuscript submitted for publication, 2018), 1.